The Italian Cultural Institute of New York and the Herb Lubalin Study Center of Design and Typography at The Cooper Union are pleased to present a lecture and panel complementing the exhibition Italian Types: Graphic Designers from Italy in America. Registration requested here. The Italian influences on American culture are far-reaching and well-documented. Yet, with a few exceptions of some key figures chronicled in Italian and American graphic design histories, the work by Italian graphic designers published in America is less well known. From Fortunato Depero’s move to New York City in 1928 to Unimark International’s work of the 1960s and 1970s, Italian graphic designers were living and publishing important work in the U.S. The sixteen designers featured (Italian-born and a few “adopted” Italians) contributed commercial graphic design in America during the pre and post World War II eras from approximately 1928 until 1980. With over seventy original works, the exhibition aims to bring more attention to this prolific network of collaborators who, with their unique achievements, played a significant role in coalescing modern graphic design in America. 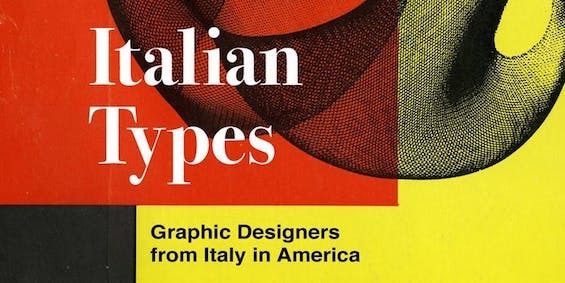 The related publication Italian Types: Graphic Designers from Italy in America (Corraini Edizioni, 2019) includes essays by Steven Heller, Alessandro Colizzi, Alexander Tochilovsky, and curators Patricia Belen, Greg D’Onofrio, and Melania Gazzotti. Exhibition on view from March 21 to May 2, 2019, at the Italian Cultural Institute of New York (686 Park Avenue and 68th Street, New York City). — Introduction by Giorgio Van Straten, Director, the Italian Cultural Institute of New York. — Greg D’Onofrio introduces the poetic forms of pre and post World War II graphic designers featured in the exhibition including important milestones published in America, particularly New York City. — Alessandro Colizzi explores another face of America focusing on Heinz Waibl, Giulio Cittato, and Piero Ottinetti who all gained fundamental design experience in Chicago through different paths. — Alexander Tochilovsky looks closely at Massimo Vignelli and Bob Noorda’s approach of putting “people first” during the design process for the wayfinding system and signage of the New York City subway. — Patricia Belen moderates the Q+A. Patricia Belen – educator, co-founder of Display, Graphic Design Collection and designer at Kind Company, a design office in New York City. She has curated exhibitions on mid-century, modern graphic design at Fordham College at Lincoln Center, Pratt Institute, Northeastern University and Torino Graphic Days Festival in Turin, Italy. Since 2014, Patricia has taught courses in graphic design and web design at Fordham University where she is an artist-in-residence. Alessandro Colizzi – professor at UQAM’s École de design in Montreal, where he teaches graphic design history, typography, and type design. He holds a PhD from the University of Leiden, an MA in Type Design from The Hague’s Koninklijke Academie van Beeldende Kunsten, a postgraduate diploma from the Atelier National de Recherche Typographique, and an MLitt in English Literature from the University of Rome La Sapienza. His research interests are focused on graphic design history, typography, type design and information design. He regularly publishes in design periodicals and academic journals, and has translated design-related works from English, Dutch, and French. He is a member of the Association Typographique Internationale, International Society of Typographic Designers, Design Research Society and AIAP (Italian graphic designers’ association). Greg D’Onofrio – designer, educator, and co-founder of Display, Graphic Design Collection. Greg has curated, lectured, and authored essays on postwar American and Italian modern graphic design history, for subjects including: Morton and Millie Goldsholl, Pirelli Publicity 1955-67, The American Revolution Bicentennial Symbol, Elaine Lustig Cohen, The U.S. Department of Labor’s Graphic Standards Manual and Lester Beall’s Connecticut General Identity Program. Greg teaches history of graphic design at the School of Visual Arts and Cooper Union in New York City. He is the co-author of The Moderns: Midcentury American Graphic Design (Abrams, 2017). Alexander Tochilovsky – graphic designer, typographer, curator, and teacher. He holds a BFA degree from The Cooper Union and an MFA degree from the Cranbrook Academy of Art. Alexander is currently the curator of the Herb Lubalin Study Center of Design and Typography. In 2009 he co-curated the exhibition “Lubalin Now,” with Mike Essl and since 2010 has curated a number of exhibitions, including “Appetite”, “Pharma”, “Image of the Studio”, “Thirty”, “Swiss Style Now” and “We Dissent.” He teaches typography and design at the Cooper Union School of Art, where he is an Associate Professor. He also teaches the history of typeface design at Type@Cooper, the postgraduate certificate program he co-founded in 2010. In collaboration with The Herb Lubalin Study Center of Design and Typography at Cooper Union.